Kate Spade New York is one of my favourite designers, and I want to share her vibrant inspiration with you! While in California last week (and whenever else I can), I visited one of my favourite designer shops, Kate Spade New York. Kate’s style can be described as bold, colourful, and geometric, being predominantly known for her her signature green and love of polka dots. Kate’s career may have kicked off with handbags, but she’s branched out into jewelry, clothing, stationery, home decor and more. Oh yes! Last time I was in California, I picked up a gorgeous blue-green wallet and I’ve been wanting a fun new handbag ever since. It’s so hard to make a choice, especially since I know I won’t be back for a while (we don’t have a store in western Canada and shipping/duty costs from the US can be exorbitant). 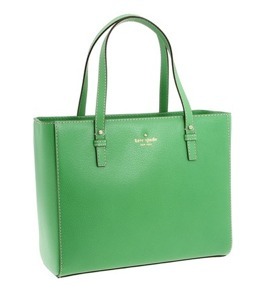 Eventually, after much pondering, I decided on a green leather shoulder bag (similar to this one below). And even better yet, I got it on sale! Aside from the quality, one of the characteristics I love best about Kate’s wallet and handbag designs is the use of bold, fun fabrics for the linings. It’s that attention to detail that makes each and every one so adorable and chic. I also adore Kate’s quotes that adorn the storage bags and care cards. If I didn’t have a son going to college this fall (budgets can be a real damper! ), I would’ve also picked up one of her watches or bracelets, or perhaps, a set of earrings. 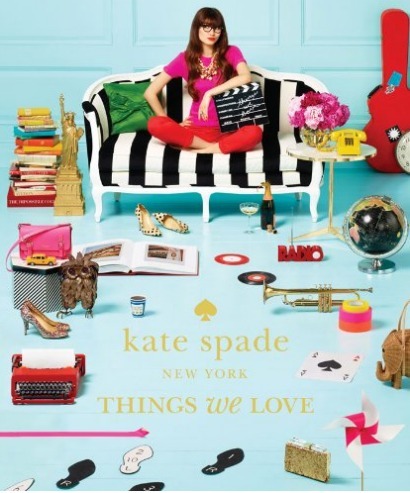 Kate Spade New York released a new book this year titled Things We Love. It celebrates 20 years of design and is chock full of vibrant inspiration. I picked up a copy and I also want to give this incredible book away to one of my readers! Note: This giveaway has ended. Wait for the rafflecopter box to load below (if it takes too long, try another browser) and log in using the facebook tab or your email (spam safe). Follow the instructions. Good luck! I appreciate Kate’s attention to detail and her fun designs. I like how the designs are classic, yet with a fun + preppy edge! I bought a Kate Spade wallet about 4 years ago. I love it. If I had unlimited budget, I would own everything she makes!! I adore Kate Spade. I have a beach bag of hers that I adore (but I rarely bring it to the beach because I’m afraid of wrecking it – how’s that for irony!?!?). My favourite aspect of Kate’s designs is the use of colour. Everything is just so happy – how can you resist it? 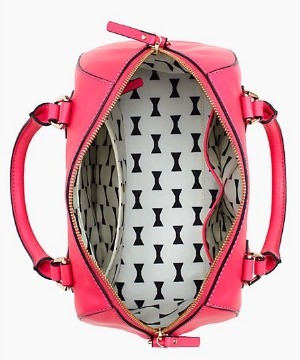 I love Kate Spade’s fun, cheerful use of colour. Her designs just make me feel happy!!! I love Kate Spade and I’m lucky enough to live fairly close to one of her outlet stores. I adore all of the color and prints, but done in an elegant way. I adore her use of colour and pattern too! Would LOVE a Kate Spade bag, heck, I’ll settle for an iphone case! I love her fresh clean colours – and her cute sayings! Love Kate Spade!! Her designs always make me smile!! 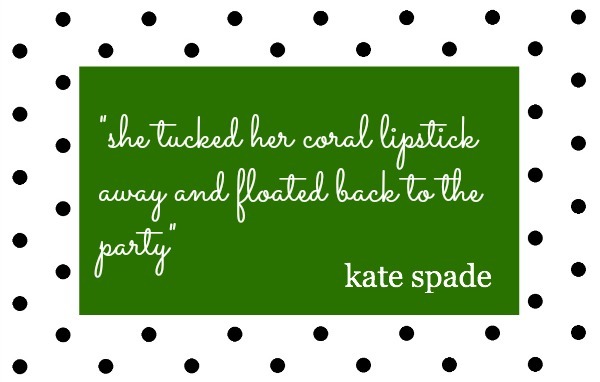 I have always been a huge fan of Kate Spade! I could spend hours trying on all of the sunglasses and dresses. It’s almost like you are whisked away into “Kate’s” world when wearing or holding one of her products. Her stationery is fab too. I love the pops of colour and simple patterns. 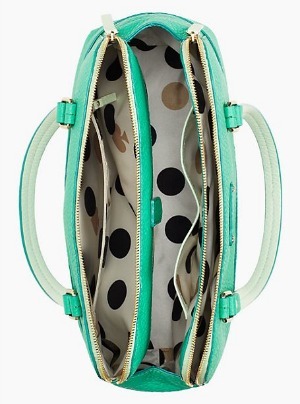 I love all of her fun lining fabrics–I have a little mini purse with a pink and gold polka dot lining that’s so fun. Her bright use of color! The store looks amazing, what a great trip! Would love to get my hands on her book. Thanks for the chance! Hmmm, what I love most about Kate Spade’s designs – I think they are classical and whimsical, bold and unassuming! Thanks for the chance Shauna, what a wonderful giveaway prize! I love the fun coloured purses and wallets too! I like that they are fun and youthful but also sophisticated and classic. I adore Kate Spade!! Love her cheery colors and classic styles! Great giveaway girl!! 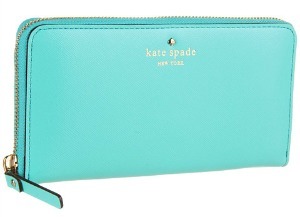 Love Kate Spade – she has such a way with colour!